I used to really like a good mystery. When I was growing up, I was all about Nancy Drew, the Dana Girls, Trixie Belden and the like. Count me in for every single one of them! These days though I don't usually desire to read to be scared out of my wits or to have creepy or suspenseful feelings. I want to read to relax, for pleasure and to learn. I was given a copy of The Big Steal and I confess to looking at it with a skeptical eye. Sure, it SOUNDED good in theory (a Virginia manor house called Wynderly which is filled with antiques, Sterling Glass an appraiser, old diaries, etc., etc.). It sounded quaint and calm. Ironically enough it was also touted as being a good mystery. Throwing a bit of caution to the wind, I dove headfirst into the book and had to force myself to tend to the house and my son while making my way to the end of this story. For me, I think life is exciting enough as it is. My family has suffered three deaths this year already. We've been traveling all over the place. We've been sick with the nasty flu which we just passed back and forth like a tennis ball. I really don't want to spend my reading time in the middle of a stressful or gory story. I just want some peace around here. I also want to be entertained, to relax and have some fun. I am happy, pleased and even somewhat ecstatic to report to you that The Big Steal fit the bill precisely! This is a calm mystery. It involves antiques. I don't know about you, but there is nothing overly creepy to me about a Sheraton secretary/bookcase, circa 1805. The main character in this book is named Sterling Glass. She has been called to the Wynderly estate to investigate an insurance claim involving some stolen antiques. Various members of the board on the estate committee are in question as to their involvement with the theft. Southern manners, hospitality and whims are tossed throughout along with a good bit of information on antiques themselves. The author of this mystery series (yes! It's a series! ), Emyl Jenkins, is herself is an antiques appraiser. I love how the book concludes with about 10 pages of information on antiques so that you can become more knowledgeable of pieces and periods yourself. Jenkins is a good story teller. She writes in such a way as to have the story slowly (and mysteriously) unfold. Naturally, her use of historical items creates stories within the story which is entertaining as well as informative. 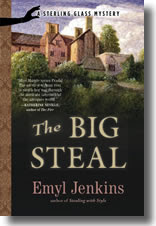 Jenkins craftily weaves her tale, and truly makes her characters come to life. Every single individual within these pages felt very real. Certain scenes were so believable to me that the characters were taking on voices of people from the south that I know! I loved it! I'm grateful to Jenkins for writing a mystery that is relaxing, informative and worth reading. She didn't cloud the story or character with too many moral deficiencies. I never once felt on edge because of a questionable scene or gruesome detail. Instead I was on the edge of my seat for all the right reasons -- I wanted to know about the stolen antiques and what was to happen with the Wynderly estate! I will happily read this book and any others in the Sterling Glass Mystery series. I will happily recommend them to anyone because they are clean enough to do so. Thank you, Ms. Jenkins, for showing me a good time and letting me relax a bit in the company you created. I really, really appreciate this book a great deal. Thanks also to Algonquin books who have published and are promoting these books! Clean modern fiction is hard to find these days. I appreciate you providing some to enjoy! I was thrilled to read your review of this book! Like you, I do appreciate a good mystery, but I'm not into all of the gore and stuff that'll keep me up at night. PLUS I love Algonquin!! They publish the best books, so that topped it for me! I appreciate your honest, thoughtful review and I'm definitely going to check this series out! This sounds good, Carrie. I enjoy a not-too-scary (or gory or explicity, etc.) mystery, too! Looking forward to getting my hands on this book! And do check out her first book in the series - it's a goodie also! And if you get chance to hear Emyl Jenkins speak somewhere, do go hear her and have her sign your books - she's even more charming and gracious than her character, Sterling. ooo! I am intrigued! It is always good to find a new (to me) series of mysteries that are good! I too love a good mystery! Nancy Drew was my hero growing up! This looks really good. Thanks for your review and personal insights. By the way, I mailed your BookSwap book last week. I hope media mail doesn't take too long to get there. I've already started Face to Face - thanks for sharing it! Thanks for this review. I love a mystery too (though I preferred the hardy boys; I was a tomboy, I guess) but gruesome, gory, depressing, and scary are NOT for me. Life has enough darkness already. So YAY! I'm going to request this from my library and I can't wait. This looks good. It is hard to find a decent mystery/thriller these days.